As short for Digital Media City, DMC is a state-of-the-art digital media entertainment (M&E) cluster formed by the Seoul Metropolitan Government with the goal of completing it in 2015. It takes up 569,925㎡ (approximately 172,000 pyeong) in the northwest part of Seoul in Sangam District. More than 30,000 people are working for over 400 companies in DMC as of the end of 2013. By 2015, about 600 enterprises will be doing business in DMC with 60,000 people. 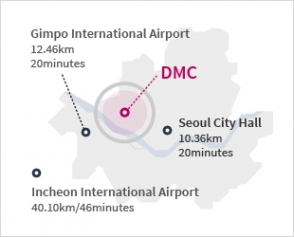 The DMC is accessible from Incheon International Airport, a major transportation hub of East Asia, within 30 minutes by highway or express railway. A huge East Asian market of 1.7 billion people can be reached in just two hours from the DMC. and the surrounding Gyeonggi Province, thus providing the best access to one of the biggest domestic markets in the world. Citizens within the DMC complex can access the Internet free of charge through a wireless high-speed fiber optic network anytime anywhere. The DMC is equipped with the world’s fastest high-speed telecom network and IT infrastructure. Supply of Land: Foreign investors are given additional points upon evaluation of their project plans. Supply of Rental Offices: Foreign businesses are eligible for low rates when renting offices from the Seoul Metropolitan Government in venture business facilities, and are given priority in the assignment of office space. Supply of Rental Housing: The Seoul Metropolitan Government provides rental housing in convenient locations for foreigners. Benefits under the Foreign Investment Law: Foreign investors based in foreign investment areas or engaged in industry support services or high-tech industries are entitled to tax breaks (national and regional), benefits in financing, and exemptions from fees according to the Foreign Investment Promotion Act and the related city ordinances. Long-term Land & Building Rents: Foreign investment companies are entitled to rent land and/or buildings at low rates for up to 50 years.